This post was sponsored by Manitoba Harvest Hemp Foods. 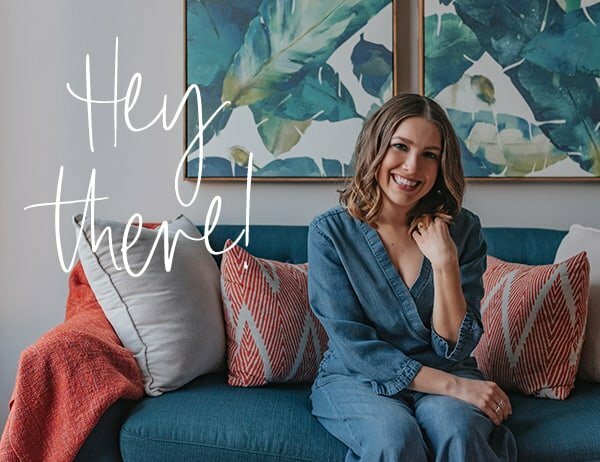 Thanks for supporting brands that align with my values and help make TFD possible. As always, opinions are my own. 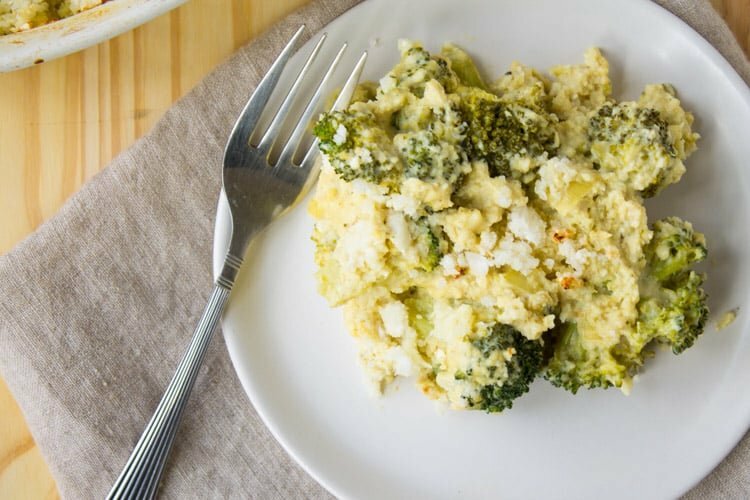 This vegan broccoli and cauliflower rice hemp casserole is the perfect vegan-friendly twist on a traditional holiday classic side dish. 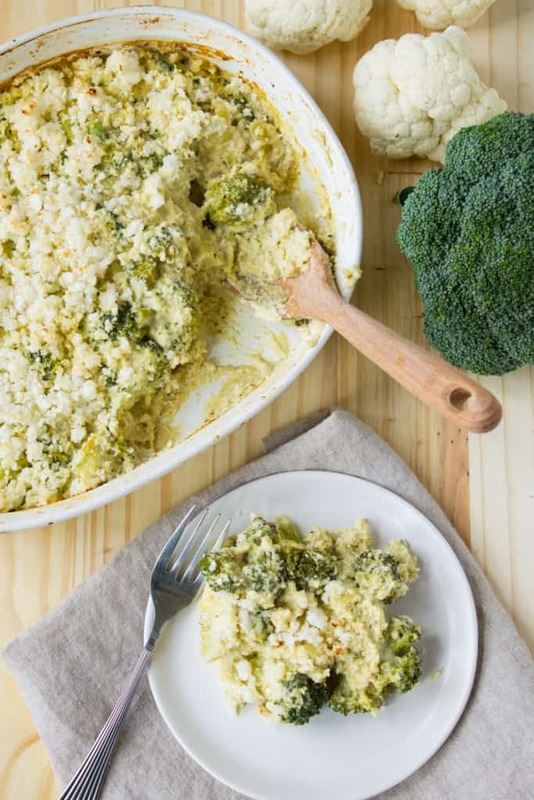 I love a good broccoli cauliflower casserole. Probably because it was a traditional holiday side dish growing up in the Lydon household. Only the version I had as a kid was swimming in Velveeta cheese and covered in Ritz crackers. It tasted great at the time but the thought of it today makes me cringe a little. As I’m writing this, I started to ask myself is Velveeta even still around? I mean it’s not like I’m ever looking for at the grocery store. And the last time I saw it was probably in my grandma’s fridge…like 18 years ago :). Well in case you were curious too, you can now sleep soundly at night knowing it is still on the market and good ol’ Kraft is referring to it as “liquid gold” in their marketing on their website. If it’s liquid gold, then why can’t I seem to find the nutrition facts for it on their website? Hmm….I wonder. So a few years ago, I revamped the family recipe to be sans Velveeta and sans margarine and Ritz by using real cheddar, Greek yogurt and whole-wheat breadcrumbs – you can get the recipe for that vintage broccoli cauliflower casserole here (as long as you promise not to laugh too hard at my pictures back then – okay, you can laugh – they were pretty awful). But this year I’m making a vegan version of this classic holiday side dish that all your plant-based friends and family members can enjoy. And this version features a delicious thick and creamy cashew cheese sauce. It also features cauliflower rice! If you’ve never heard of cauliflower rice, you’ve got to try it. It’s crazy easy to make and it’s a delicious alternative to rice or couscous. Plus, it’s just one more way to up your vegetable game. All you do is pulse cauliflower florets in a food processor until they’re couscous-sized granules and then toss them in a sauté pan to heat it up and season to taste. This casserole is topped with cauliflower rice instead of breadcrumbs. And for an extra nutrition boost, it’s packed with hemp seeds! The hemp seeds add a little nuttyness to the cashew cheese sauce, not to mention extra protein, omega 3s, and fiber! They’re such an easy way to add a little more nutrition to a dish. This casserole is hearty, filling, “cheesy” and packed with flavor. Even vegan-fare-averse-Steve, my main squeeze taste tester, loved it! Place cauliflower florets into a food processor and pulse until broken down into couscous-sized granules. * Set aside. 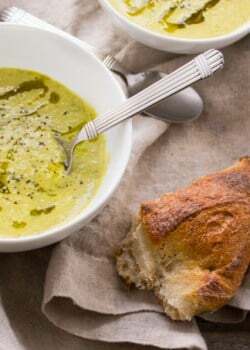 In a food processor, add cashews, nutritional yeast, vinegar, garlic, salt, white pepper, Hemp Hearts, miso, lemon juice, and ½ cup almond milk and pulse until smooth and creamy. In a large saucepan, add olive oil over medium heat. Add onion and let cook for 3-5 minutes, or until onions are translucent. Add flour and whisk until oil is absorbed and onions are coated, about 60 seconds. Add milk and whisk until thickened, about 5 minutes. Whisk in cashew cheese until smooth and creamy. 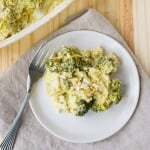 Add broccoli to a 9×13-inch casserole dish. 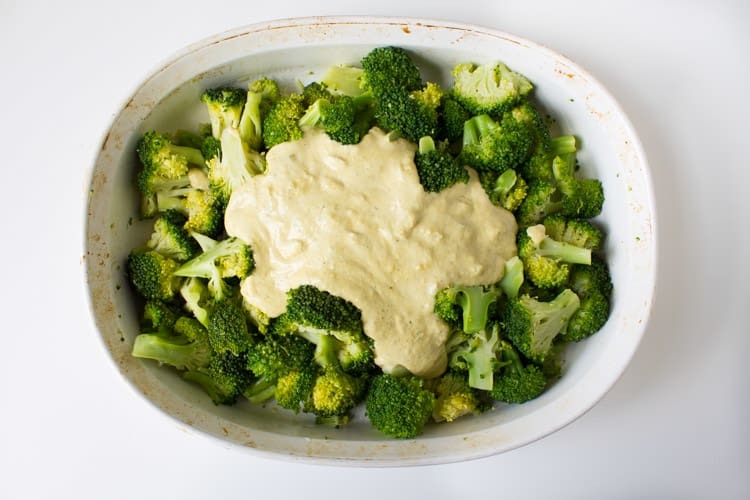 Pour cashew cheese sauce over broccoli and mix to evenly distribute. Sprinkle 1 cup “cauliflower rice” over top. Bake at 350 degrees F for 30 minutes, or until cauliflower rice starts to turn golden brown and sauce is bubbling. *Some florets may not break down. Pull these out and set aside. Transfer cauliflower rice to another bowl and reprocess the larger cauliflower pieces. Do you think I could make this a day or two ahead? 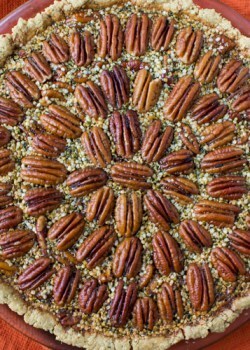 Baking it later? Sure! I don’t see why you couldn’t make it a day or two ahead! I used chia in place of hemp the first time. Now I have made it again with hemp <3’s. The chia reigns supreme for me. Sharper flavor and smoother consistency. Nonetheless, really great combo of ingredients. Thank you for the recipe! Thanks, Tina! Glad you enjoyed it! Made this for the first time today. It was good, I realized after I made it that I had forgotten the garlic. I’m sure that forgetting this is why is was only good and not really good! I have to say that my family members who think vegan food is “weird” even ate it and said it was good. I will definitely make it again, remembering to add the the garlic. Oh wow! This looks so creamy and delicious.I really love how you used cashews to make it creamy, I’ve been wanting to try this method but haven’t gotten around to it. I am going to have to give this one a try! Thanks, Lauren! Hope you enjoy! This looks absolutely perfect. I am adding it to my Christmas dinner menu NOW! I thought I had put hemp hearts on everything but hadn’t on cauliflower yet! Can I substitute the miso for something else? You could try just omitting it. Or, maybe try soy sauce or tahini as a sub? I’ve never tried those subs with this recipe though so not sure how much it would impact the taste. 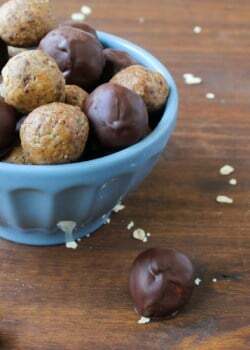 When you load in nooch and cashews…I KNOW i’ll love it! YUM! Hi Cristie! 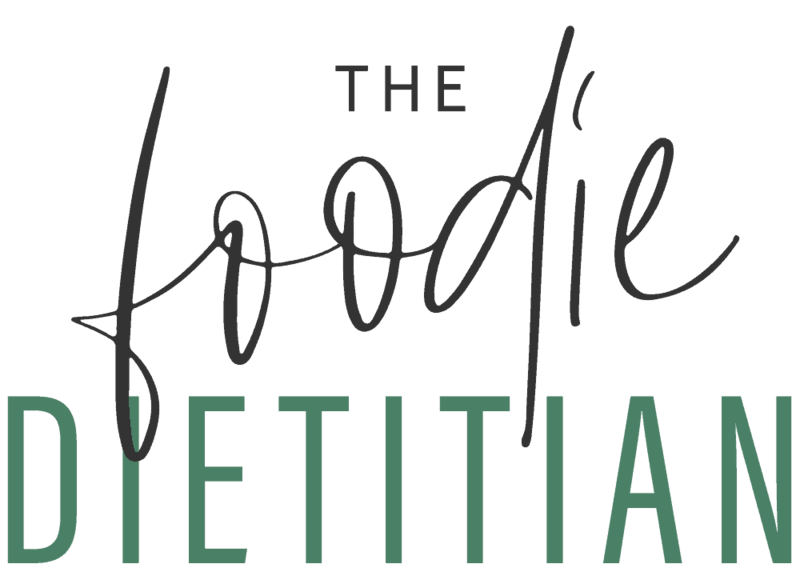 You could try a gluten-free corn starch or arrowroot powder. 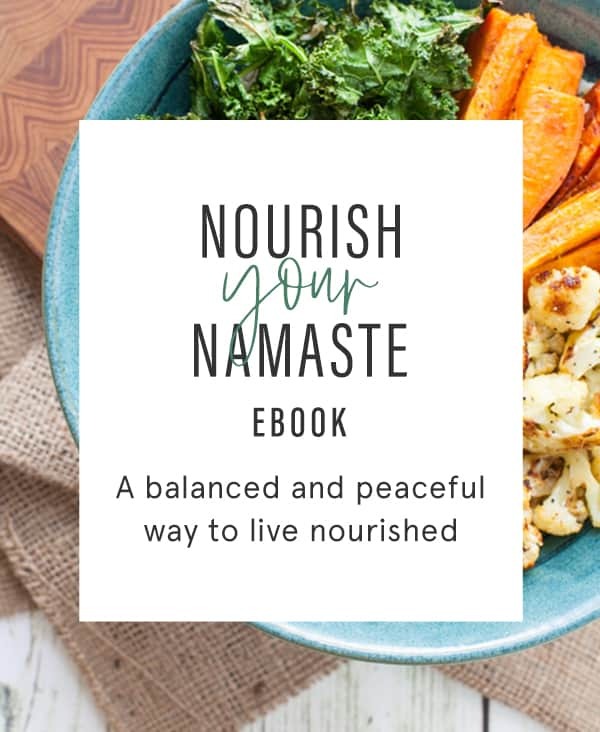 This looks amazing and I am going to try!! Thanks, Madeline! Let me know how it turns out!